According to the second annual report about the implementation of trade agreements issued today, these agreements – covering nearly 70 markets all over the world – are proving effective in removing barriers to trade and promoting high standards of labour and environment protection. Improving drinking water quality, limiting the use of antibiotics on farm animals and a ban on plastic straws and cutlery were among the highlights of this week’s plenary session. The European Commission has approved an investment package of €243 million from the EU budget for projects under the LIFE programme supporting nature, the environment and quality of life in Europe's transition to a more sustainable and low-carbon future. For 2019, funds available for Erasmus+ are expected to increase by €300 million or 10% compared to 2018. From an expected budget of €3 billion for next year, €30 million has been set aside for dedicated European Universities. Single-use plastic items such as plates, cutlery, straws, balloon sticks or cotton buds, will be banned in the EU under plans adopted on Wednesday. These products, which make up over 70% of marine litter, will be banned from the EU market from 2021, under draft plans approved by Parliament. MEPs backed plans to improve consumers’ trust in drinking water from the tap, which is much cheaper and cleaner for the environment compared to bottled water. The European Commission today presented its Work Programme for 2019, setting out three main priorities for the year ahead. The European Commission has identified in the draft budgetary plan submitted by Italy for 2019 a particularly serious non-compliance with the fiscal recommendation addressed to Italy by the Council on 13 July 2018. Leaders agreed to further connect both continents to boost trade, improve security, preserve the environment and bring societies closer. They also discussed foreign and security issues. The European Council focused on migration and internal security. At the European Council (Art. 50) working dinner on 17 October, EU27 leaders reviewed the state of the negotiations with the UK. 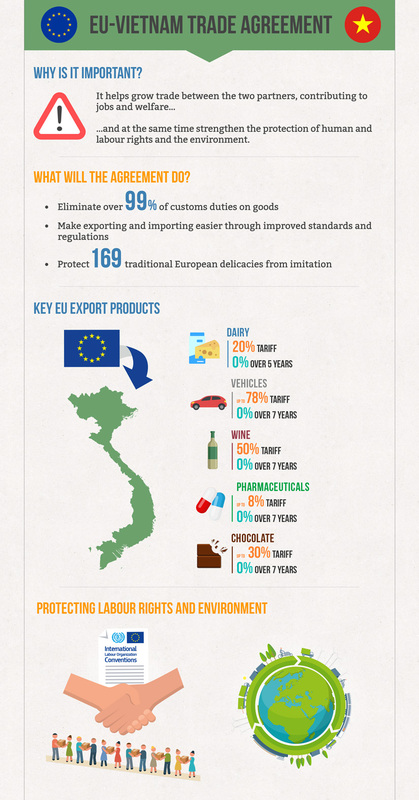 The European Commission adopted the EU-Vietnam trade and investment agreements, paving the way for their signature and conclusion. Through this adoption, the Commission is demonstrating its commitment to putting these agreements in place as soon as possible. The Council reached a political agreement on fishing opportunities in the Baltic Sea for 2019. Ministers also exchanged views on the position to be taken by the EU at the annual consultations with Norway in the framework of their bilateral fisheries agreement. Foreign ministers discussed the most pressing issues on the international agenda; among them the case of the missing Washington Post columnist Jamal Khashoggi, where the EU expects full and transparent investigation by the Saudi authorities in full cooperation with the Turkish authorities. The Council adopted its position on the directive on insolvency, restructuring and second chance. Home affairs ministers discussed a Commission proposal on the European Border and Coast Guard Agency (EBCG). They expressed their general wish to strengthen the mandate of the EBCG.